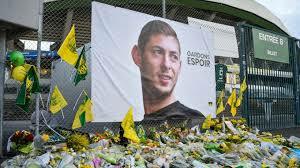 February 7 – French club Nantes have reportedly requested the first tranche of payment from Cardiff City over the £15 million transfer of Emiliano Sala whose light aircraft went tragically missing over the English Channel a fortnight ago, with wreckage only recently discovered. The Argentine-born striker, along with pilot David Ibbotson, were the only people on board the flight which lost radar contact near Guernsey on 21 January. Sala, 28, was Cardiff’s record signing but never got to play for the club. The transfer fee is due to be paid in instalments over three years and media reports said Cardiff received correspondence from Nantes on Tuesday in which the French club threatened to take legal action if the first scheduled payment is not received within the next 10 days. Although Nantes were entitled to the first slice of Sala’s fee by now, the transfer is highly sensitive given the circumstances and the timing. The aircraft was only discovered on Sunday and the Air Accident Investigation Branch (AAIB) has not yet said whether the body spotted in the wreckage, found on the seabed, is that of the Argentinian striker or the pilot.